I just did mine this morning PDXREALTOR and had the same problem. Is there a 4th possible ecu input? Is there a 4th ecu input wire I could use on a 2005.5 obxt? Some other sensor wiring like the uppipe EGT, pcv anti-tamper bridge, purge solenoid, charcoal canister sensor, etc. *or even front o2s* so that I can AP datalog all 4 channels of the AEM 30-2340 4 channel uego? 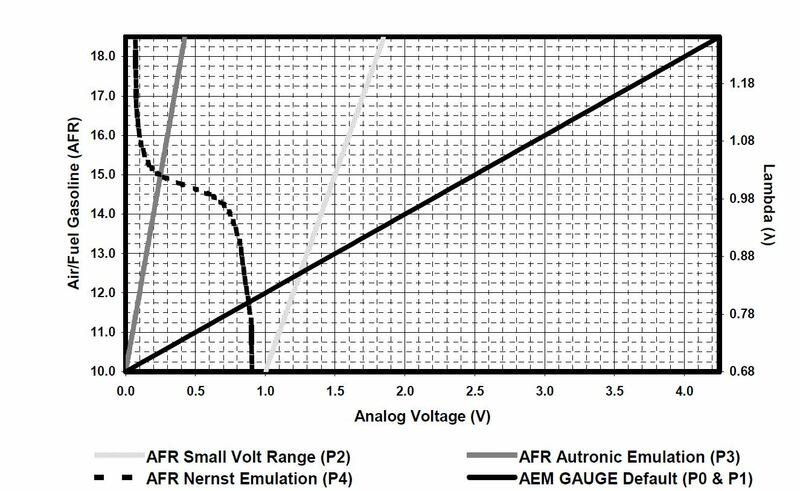 When I used the AEM Specs for the voltage to AFR curve I got way different results when compared to the actual gauge read out. At idle my AFR's reported on the AP was around 15.0 while it was 14.4 on the gauge. I had to massage the numbers a bit to compensate for the difference. Respectively in accesstuner and the reading was about a full point off like yours, aem gauge read something like 14.7 and AP was reading the wideband at like 15.5. Mind to post up which gauge you have and what you had to use in ATR to get it to match up, in case anyone else needs it? Mine ended up reading .3 higher in btssm than what actual wideband gauge reads. As heiche said he thinks the rear O2 input is slightly biased. Read my post user name makaveli in the legacy forums below. As long as the scale is keeped to the linear scale, (changes at both ends of the scale it) matchs the gauge perfectly. Last edited by my9999; 08-02-2017 at 10:07 PM. not sure if it's been covered or not, but i just ran into this issue: 06sti with aem wired into rear 02. reads on ap and logs fine, but it wouldn't go richer than ~11.4 no matter how much fuel my tuner added. the signal wire to the rear 02 was still intact, they never cut the wire downstream, just tapped the original wire. the theory is that it's still sending about 1volt to the ECM plus the signal from the wide band, preventing it from reading lower than the AFR actually was. the first test was to peek at my wide band gague during WOT. sure enough it was in the 10's while the "rear 02 only" was still 11.4. figured my options were: cut the signal wire to prevent anything from adding to the wideband signal, or disconnected the sensor to prevent it from being powered to begin with. I figure, the ECM isn't using this information anyway, since the input on the ECM has been hijacked for wideband datalogging... so I disconnected the rear 02 from the harness plug closest to the rear 02, and bam 10.5 afr WOT now. 05 OBXT. I am running SD and using a 4 channel aem wideband in the header- wired data outputs to ecm inputs. cyl 1 to rear o2s, cyl 2 to Maf, cyl 3 to tgv left and cyl 4 to tgv right. All show 0-5v scale on AP. Also wired ethanol content meter to EGT input. So I have a X-series wideband hooked up currently in my 13' WRX, I tried wiring the white output to the TGV right data cable (Red/White) just by piggybacking it. Had my tuner send me the adjusted map for it, and my AP is only reading either 12 or 15 under Sns Only TGV R. Its not in sync with my gauge nor does it change under boost. EDIT: When connecting Gauge output to TGV data cable, you must leave TGV cable not connected to the TGV or it will mess with the sensor. Last edited by Bickz; 12-18-2017 at 09:24 PM. Would I still be able to use my gauge if i the wide band to the rear o2? I imagine I would just tap into the white 0-5V cable that goes to the gauge? Also how does this affect smog? Last edited by Penguin_02; 02-10-2018 at 01:11 AM. Does anyone have the correct scaling numbers for an innovate gauge? Or, if they both use the bosch sensor would the numbers be the same? Amazing what one can find in the instruction manual. question here...so I'm running a V9 motor and the DP has two ports for o2 sensors because theres is no o2 on the up-pipe. so theres one located by the turbo and the other down the pipe like normal.....if I'm adding a Wideband like the one in this write up, should I add a 3rd bung and run it from there? or can I just use the rear o2 and maybe have the tuner take care of that code? or is the rear o2 important enough to where I should leave it in place? thanks for the advice and great write-up! I was in the same situation recently, and I added a bung to the dp up near the turbo. But, removing the rear is no issue.... I would just go with what you can do easier. A note for anyone reading this and wondering if you can still utilize an AEM (or other aftermarket) wbo2 when you have the Cobb Flex Fuel kit installed as well: you can! The pressure sensor hijacks the RH TGV to output it's readings and the ethanol content sensor hijacks the LH TGV so those two options are both out. The other option to tap into for your wideband is the rear o2 sensor. 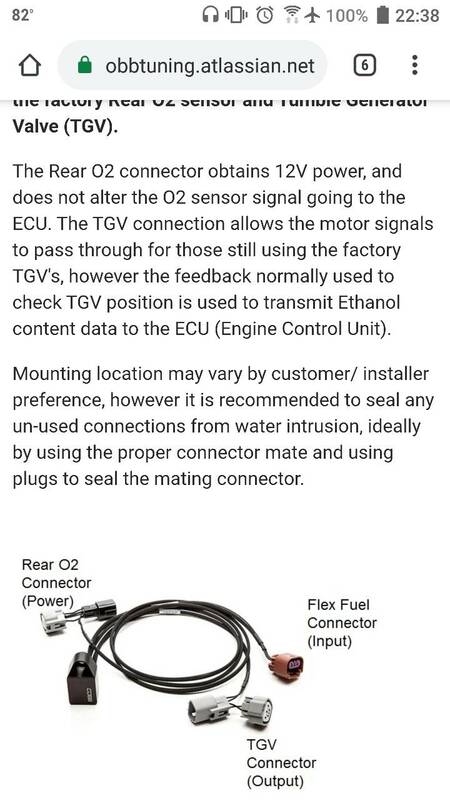 You may think that that option is already taken as well, as I originally did, since the flex fuel module also connects to the rear o2. This isn't true. The module only intercepts the rear o2 sensor connector to steal 12v off it. It does not hijack or otherwise touch the signal wire so you're free to tap it for the wideband using the procedure outlined above. Hopefully this clears up any confusion anyone else may have had when looking into this. Has anyone got the smoothing to work in ATR? Adjusting the smoothing number doesn't seem to do anything. Pay for ATR only to find you cant use custom sensor logging. Pay for dyno tune only to find your Cobb PRO tuner cant set it up for you. "Oh yeah you have check engine light"
They don't allow custom sensor logging on ATR? Since when? I thought that was unlocked after the paid classes went into effect. Dumb question - Does this method of wiring work with opensource. For instance if I use Romraider to log.. Yes, just need to modify the logger definition file to interpret the signal correctly. Could I just buy a sensor and Visconti cable to achieve this?